AS many customers ask if Will we sell E-juice, now I can give you the answer "yes ". The G-TASTE E-juice is 10ml each bottle , with optional 0mg/3mg/6mg nicotine strength.You will enjoy the amazing flavor of Tobacco,Blueberry & Mint,Nuts Cake,Watermelon & Strawberry. 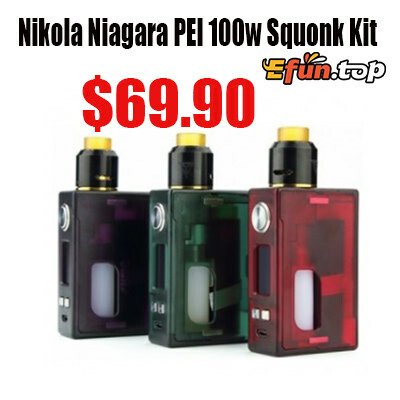 Nikola Niagara Pei Kit is a squonk kit made of PEI material. Niagara PEI can contain 6ml e-juice and can fire up to 100w. Its multiple taste modes including norm, soft, hard and user, which can exactly satisfy your taste bud. It is compatible with 18650, 20700 and 21700 batteries, bringing you great convenience.